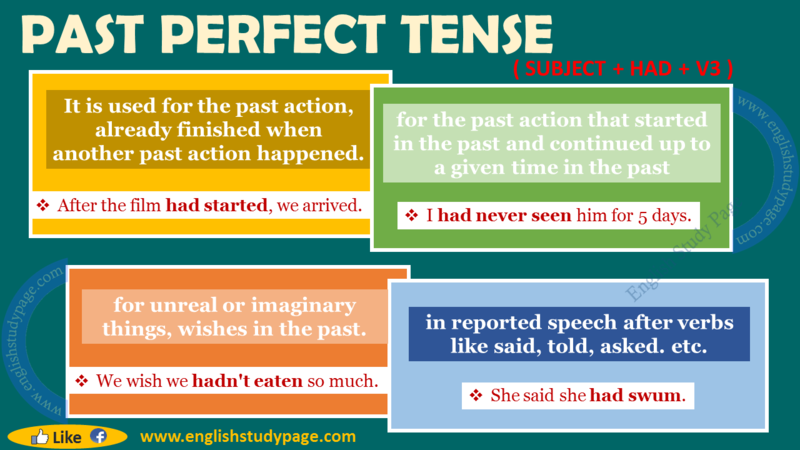 PAST PERFECT TENSEPast Perfect Tense indicates a past action which is completed before another past action. had –> ‘d Ex: I‘d looked. had not –> hadn’t Ex: I hadn’t looked. When I return home, she had already left. I went there after I had completed the task. She hadn’t come late to the school before. My father and mother had been married for two years when I was born. Until Linda went to England, he had never spoken English. My son told me that he hadn’t been able to make such a beautiful picture before. If you had studied hard last year, he would have passed all his exams. Lisa had done her homework so she was happy. David had lived in Florida for ten years before he moved to California. Had they gone out when I called? The woman had cried till the morning. I hadn’t returned to university. Hadn’t Helen left when I went to the club? By the time we came, she had finished the project. I had already taken an umbrella when it began to rain. After we had left the house, the telephone rang. If she had looked around in detail, she could have found the key. We use other question words ( Like Who, What, Why , etc.) in past perfect tense. What had you heard from the outside? Why had he been so angry? When had you written this novel? 1. Past Perfect Tense is used to express the past action, already finished when another past action happened. He had just escaped when the police came. After the film had started, we arrived. I had never seen a lion before I went to Africa. 2. It is used for the past action that started in the past and continued ( or done several times ) up to a given time in the past. If I had heard the question, I would have given you the answer. If I had had some money, I could have bought him nice shoes. If you had asked me, I could have helped you. We wish we hadn’t eaten so much. If you had loved me a little, I would have done everything for you. 4. Past Perfect Tense is used in reported speech after verbs like said, told, asked. etc. He said he had trusted her very much. 1. 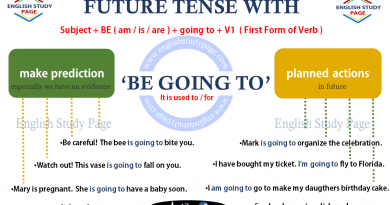 “Past Perfect Tense” is often used with “Time Clauses”. Time Clauses have two clauses which are main clause and time clause. Time clause is the clause beginning with time words ( when, after, before, by the time, etc. ). 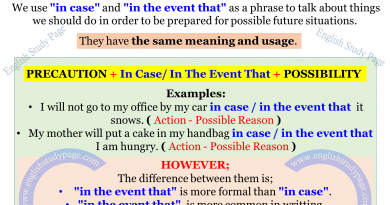 The clause or the event, which happened before, is expressed with “past perfect tense”. 2. If the time interval between two events is not too much, which means, if two events happened one after the other in series, then there is no need to use past perfect. 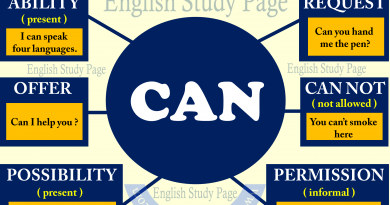 We can use simple past instead. When I opened the door, the cat came in quickly. As soon as the phone rang, Alice answered the phone. If they had listened to me carefully, they wouldn’t have done wrong in the exam. If you hadn’t come late, you could have met him. He talks as if he hadn’t known anything about what happened yesterday. She acts as though we hadn’t met last night. You came late. I wish you had come in time. We drank so much. We wish we hadn’t drunk so much. If only I had learned English when I was at high school. If only I hadn’t argued with my friend yesterday. My father took me to the theater. I would rather he had taken me to the cinema instead. My friend gave me a teddy bear as a birthday gift. I‘d rather she had given me a book. We had hardly/ scarcely closed our eyes when we started to sleep. I had no sooner closed the phone than the door was knocked.